when I heard a strange sound coming from outside. It was a scratching rustling sound. I figured I would have to take a walk out there to check it out and to also allow the dog to relieve himself. As I wondered under an aging apple tree I heard it again coming from above me. On a branch which I have guessed to have perished from some insect infestation, there was a woodpecker. This little guy seemed to be the proof that I needed concerning the reason why the branch was dyeing off. I stood there a coupe of feet from him just watching, to which he took no notice of me. I went back into the house and grabbed my camera and a 150 sigma lens and went back out. As I approached there was an uproar of chirping and my feathered subject was chased away by two other similar birds. One of which returned shortly afterwards, but this one was significantly more of a shy subject. I left for a few moments to get a longer lens and to allow calm to return to the little orchard. 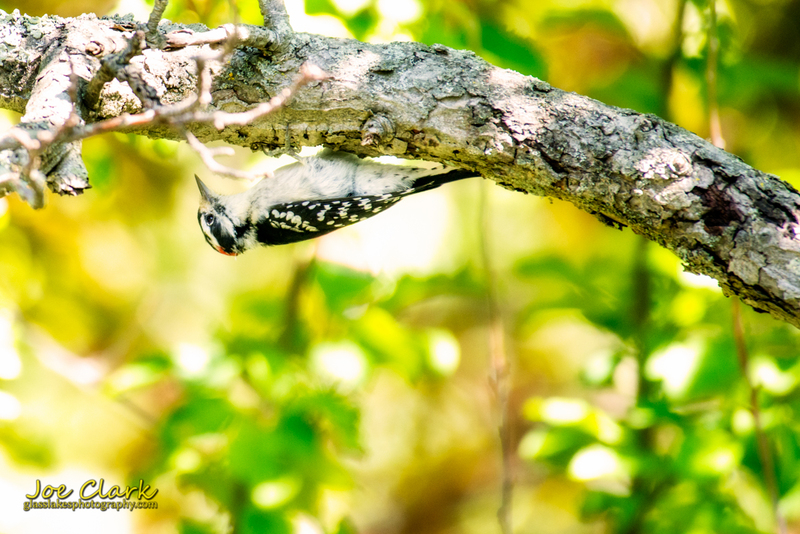 When I returned with the 80-400 the woodpecker was still fairly skittish, I got a few shots of him and with a flutter it seemed that my original subject had returned. I got front row seat to watch the hunting methods employed by the small bird. Pictured below was one of the tap and seek moments. Like what you see? Many prints, including this one are available in the gallery.